Tomorrow, Nora and I are heading to America on our first solo trip since that last horrendous drive from New York to Massachusetts. We are loading the car with toys and books, clothes, the pack-n-play, snacks and sippy cups, and lots of prayers that Nora will manage the 6 hour drive ahead of us without too much screaming. 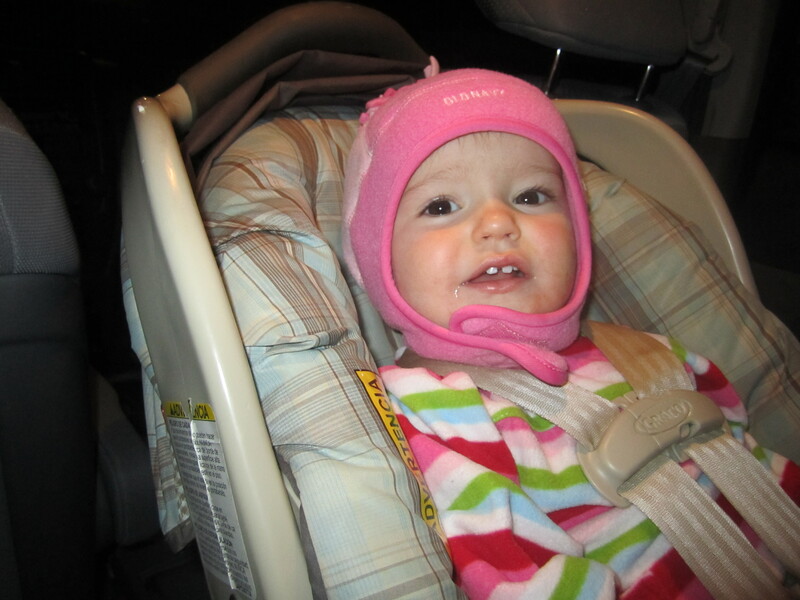 I’m especially nervous, because Nora is still stuck in her “baby-bucket” car seat. Semi-reclined and rear-facing; not able to look out windows or see me sitting up front. But, with a long drive ahead of us, and three months growth for Nora, I thought it would be good to re-examine our car seat situation. So, this morning we stopped by the doctor’s office for a quick weight and height check. She’s 19 lbs. 13 oz. and 30 inches tall, so unfortunately the old car seat stays. 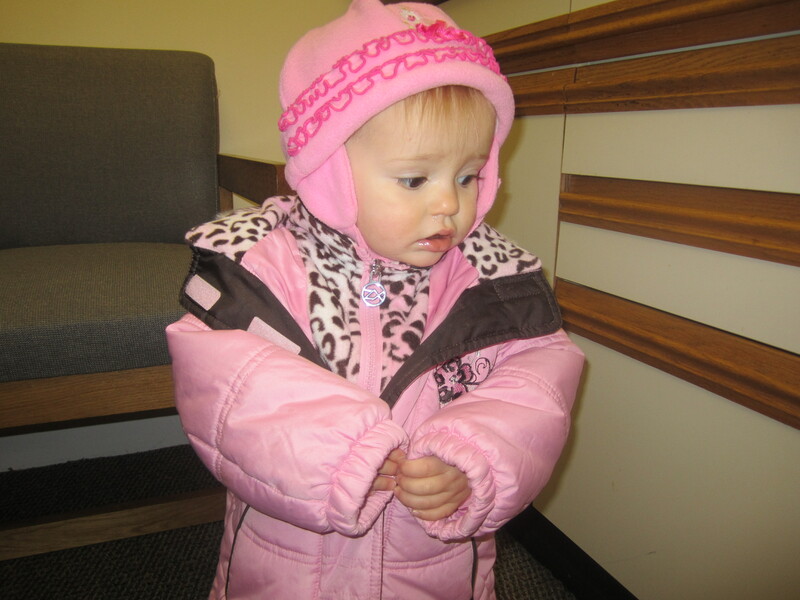 Sometimes, it seems like our little girl is going to be a peanut forever: at 15 months, barely fitting into her 12 month clothes…riding in an infant seat when all the other kids are turned around. It’s so easy to get impatient waiting for the next milestone and to try to push our kids to get bigger and act older faster. Nora is walking and talking and acting so much like a little girl that it’s easy to forget she’s still a baby; that only months ago she was just learning to crawl and stand on her own. As disappointing as it is to have to keep using her infant car seat, it’s a good reminder for me that she’s still so little and not to push her to do things she’s not yet ready to do. 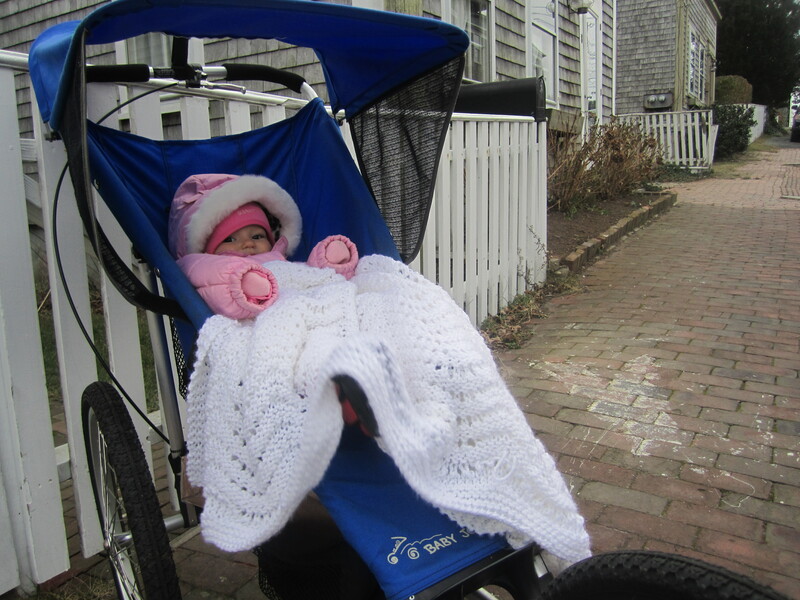 And, as it turns out, staying rear-facing may be better for her in the long-run. I was surprised to see a NPR report this morning that says facing backward is the safest way a child can ride in the car. 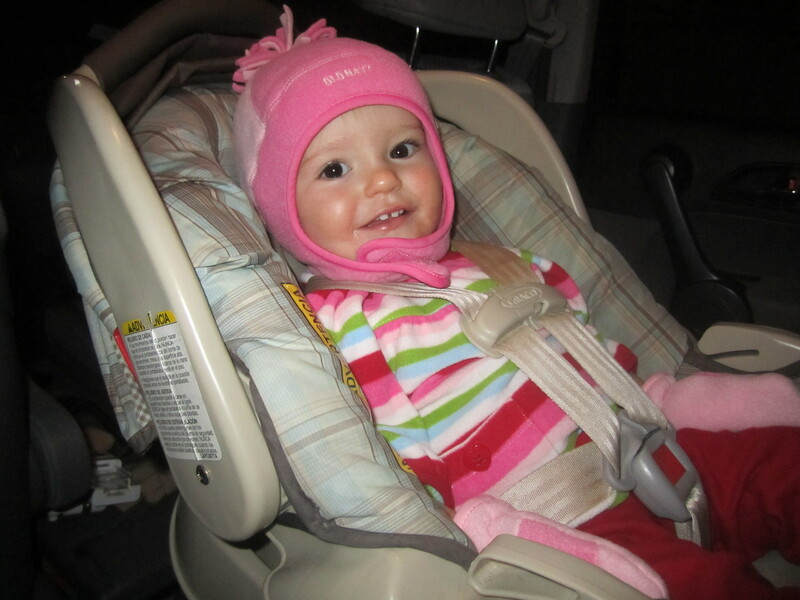 In fact, yesterday, the National Transportation Safety Board held a forum on car seat safety in Washington and one of the expected recommendations is a change in car seat safety law to require children to be rear-facing longer. According to the news story, European laws require children to face backward much longer than we do in the US; in Sweden, kids as old as four are still riding backward. After doing more research on the best car seats and positions, we may even get rid of our forward-facing seat and reinvest in a convertible rear-facing seat. 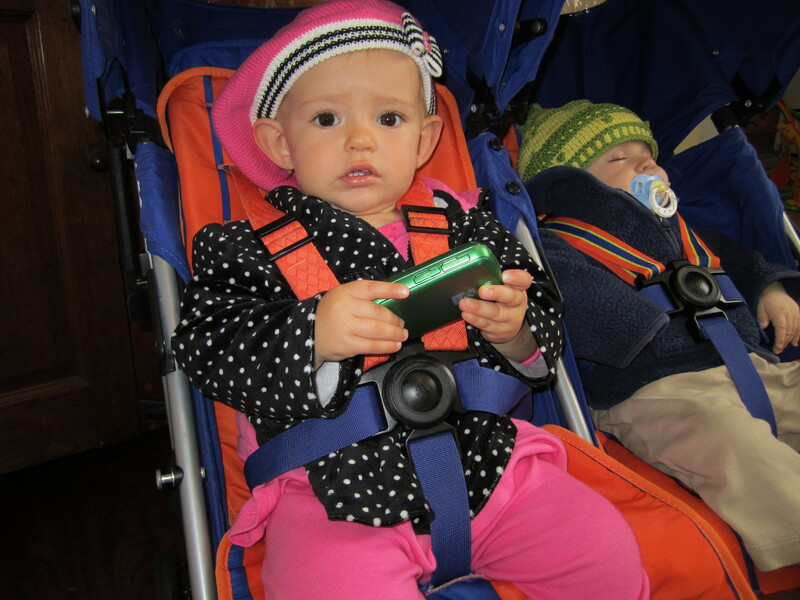 With a long drive ahead of us, that “dumb old” car seat is looking better and better. Good luck on your trip. It always takes us a few hrs longer than planned. Frequent stops and nursing in parking lots. I once nursed while hovering over her car seat while Scott drove b/c we couldn’t get out of a traffic jam. We leave for a 14 hr trip (over 2 days) next week. I’ll be thinking of ya! Happy holidays. Do you have a mirror so you two can see each other with backward facing seat? I have one if you’d like to borrow it. Jessica took the thought out of my head with the mirror question… I never had one but I think it would help on a long trip if she’s rear-facing. Safe travels. Can’t wait to hear about your trip! I don’t have a car mirror…but I do have a hand mirror. Maybe I can rig something up…I’m on the 6:30 ferry, so I think it’s a little late to borrow one. Jess, I’ve done the car seat nursing thing too! It’s just too bad I don’t have a driver, otherwise this trip would be nothing. Amber – random – one of my friends and I were talking about this issue this week – she said she kept her little girl there until her knees were to her chin! No worries – safe than sorry! Good luck on your drive! we switched aria b/c her legs were so long! I was afraid of them breaking in an accident. of course, compared to head injuries, not so bad i guess, but she just looked so squished in there. she just barely fit the wieght limit though!